Aristophanes (ca. 446-380 B.C.) - Not all Greek plays were tragedies. There were comedies as well. However, while the Dionysia held a competition for comedy as well as tragedy, only one humorist from this period has stood the test of time. His name is Aristophanes. Born about the middle of the fifth century, he was younger than any of the three tragedians, but still rose to prominence in time to become known to Sophocles and Euripides. Outside of his plays, not a lot is known about the man; and not much of his personal life can be drawn from his plays. The year of his birth is unknown, as is the year of his death. However, 446 or 445 would be a pretty good guess on the year of his birth, because his first play, The Banqueters, was entered in the Dionysia in 427 B.C., and he notes in The Clouds that he was too young to produce it in his own name. His last play appears in 388 B.C. and his son, Araros, began entering plays of his own in the year 375. So it has been inferred that he probably died sometime in the decade between 385 and 375 B.C.. He is known to have written 40 plays, eleven of which survive extant. One thing that is known about him is that he pushed the conventions of Athenian society and it landed him in trouble on more than one occasion. His second play, The Babylonians, likened Athens' allies to slaves under the thumb of the powerful city-state. This did not sit well with the city's most powerful politician at the time, Cleon. He brought Aristophanes before a court and charged him with treason, for which he was acquitted. Aristophanes responded by writing Knights, which was a direct attack on the politician. 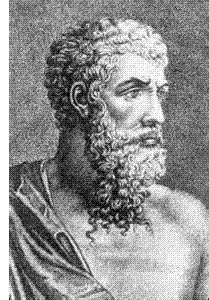 Their feud ended only with Cleon's death in 422 B.C.. More than the three dramatic writers, Aristophanes is associated with the Peloponnesian War since the bulk of his career coincided with this period.